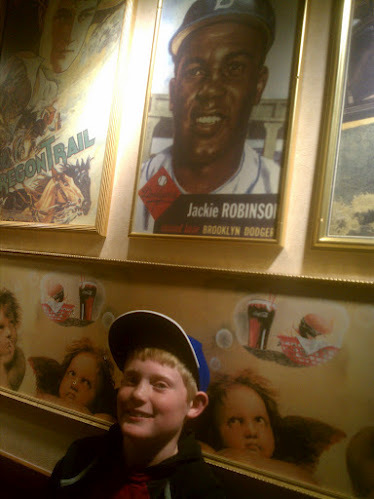 Hi, my name is Ethan and I learned in school that Jackie Robinson lived his life by nine values and used them to break the color barrier in Major League Baseball. This is a story about a time that I used those same values to overcome a barrier in my life. At my school football got banned because some kids weren’t playing safely. I was very mad. It seemed unjust. I went back to my house that night to talk about it with my family. My father suggested a petition. At the time, I didn’t know what a petition was. So I asked. He explained that a petition is like a letter stating what I think should happen. It also should have signatures of the people who think the same as me. I decided to do it, but I was anxious. I couldn’t believe what I was on the verge of doing. 1. The school wants us to be active. Football is a safe-fun way to be active. 2. Without football kids get in arguments over games. 3. Exercise makes you better in school. On the following pages you will see the signatures of the people who think the same as me. “Yeah, I think that is good.” I said to myself. The next day I asked my friend Jacob to help me.. Using teamwork, we got the signatures in one recess. Then we turned the petition into Ms. Lilly. I went to bed happy that night, thinking that tomorrow would be a great day. I would have a talk with Ms. Lilly and then football would be back! Well, did I get a surprise! Days went by and no word from Ms. Lilly. I was getting pretty worried. What if she didn’t get the petition? What if she didn’t care? All of these possibilities were flowing through my head. Then, one day, during math, over the PA system I got a call from Ms. Lilly, saying that she wanted to talk to me. I left her office feeling very worried. I didn’t know any fifth graders, let alone three of them! But I had to do this. I had to do this for my school and for my friends. I was determined. Finding kids from each grade to join the committee took a lot of persistence, but with teamwork, we got it done. Now all that needed to happen was the meeting. I couldn’t wait. At the meeting the next day, we started thinking of rules, voted on them, and then wrote them down. Soon we had a page full of rules. When we presented them to Ms. Lilly, she said, “Great job,” and told me to speak on the announcements the next day. The next day, on the morning announcements, I explained that anyone who wanted to play football would need to sign a contract to follow the rules that the committee had written. Twenty-five players attended the meeting and signed their names. And that’s how I got football back for my school! 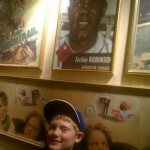 To get football back, I had to use Jackie Robinson’s values. I was very committed to overcoming this barrier. Using a petition was an example of good citizenship. It took courage to talk to Ms. Lilly. It took determination to find fifth graders for the committee when I didn’t know any. I had to be persistent. My friend Jacob and I used teamwork to get the signatures. My school is very diverse, and football is a sport that we all play together. Getting football back for all of them felt good. Well, I got the job done, didn’t I? That shows excellence.